We Still Have room for Sellers at our Annual Artist’s Yard Sale! Calling all artists! Here’s an opportunity for you to clean out your art studios and sell all your excess art supplies and artwork. 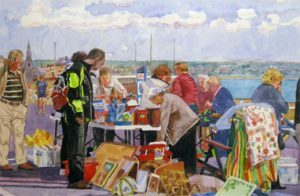 On Saturday, May 18, 2019 from 9 am to 2 pm the Falmouth Art Center is holding its annual Artists’ Yard Sale. Sign up to sell your excess art supplies such as paints, canvases, craft supplies, artwork, brushes, books, frames, easels, crafts and so forth. To participate in the yard sale, you may rent a table from the Art Center or bring your own and pay a lower fee. You keep ALL the profits from your sale-it’s that easy! To sign up, call the office at 508-540-3304. Reserve your space early! Space is limited and table locations will be determined by the Art Center on a first come, first serve basis. We ask participants to plan on being at the Art Center for the full length of the yard sale (9-2).